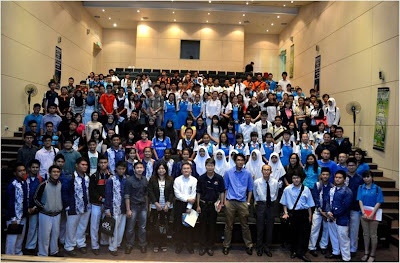 The Institute of Engineer Malaysia (IEM) and Young Engineer Section (YES) of Miri had successfully organized the Annual Engineer Your Career in Pustaka on 20th April 2013. This event was held every year with smart partnership with Pustaka Miri. A total of 183 students from 11 secondary schools across Miri joined the event. The participating schools are SMK Chung Hua, SM Sains, SMK St. Joseph, SMK Luak, Kolej Tun Dato Tunku Hj Bujang, Kolej Vokasional Miri, SMK Taman Tunku, SMK Pujut, SMK Riam, Pei Min Middle School, and SMK Lopeng Tengah. The objective of Engineer Your Career is to assemble some of the brightest mind in engineering across the industries to share the role of engineers to secondary school students. The speakers consisted of lecturers from University and engineers from a few oil and gas companies in Miri. They were represented by Tan Yin Ling, Lesly Ajeng, Engr. Chow Yuet Hong, and Ir. Leon Chong from chemical, civil structural, mechanical, and electrical respectively. Ir. Lim Chye Ing introduced the function of IEM and route to become professional engineers. Last but not least, student engineer Ken Cherng and lecturer Terence Tan also shed some lights on the importance of university and advice on studying engineering. Students and participants get to benefits from the speakers’ experience and increase understanding about various engineering disciplines before making decision into tertiary education. The event ended with a short Q&A forum for students to raise questions to the speakers in regards of engineering and university.